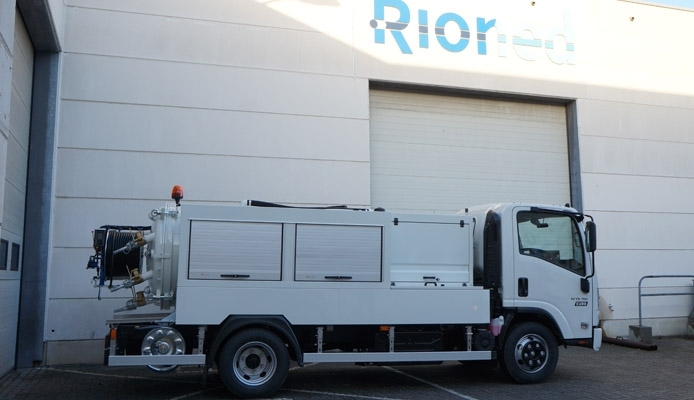 Since its launch in 2015, Rioned’s FlexCom combination jet-vac units have become a popular choice for drainage contractors and utility companies. There are now over 30 models in operation across the UK, and the company recently announced some enhancements for the 2018 model. With a focus on simplicity of use, the FlexCom 7.5t was designed as a single-resolution unit that can be operated remotely by a single person. An added bonus is that the vehicles can be driven without a HGV licence by anyone who passed their test before 1997. The powerful unit features a high-performance vacuum pump and can be supplied with several high-pressure pump configurations. The suction hose connects to a 3,000 or 3,500 litre partitioned tank for immediate operation. The hydraulically operated hose reel pivots 180° and includes 100 metres of high-pressure hose. For contractors such Advance FM and Relative Groundworks, who both took delivery of new units this year, the new equipment has meant they can expand capabilities and attend an increasing number of call outs. The FlexCom is also available custom built on larger 10t and 12t chassis.